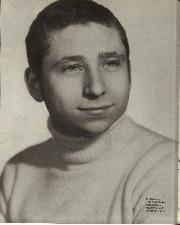 Jean Todt, Ferrari. There is so much irony in the combination of those names. In the history of the sport you won't find two men whose approach to team management was more diametrically opposed than Enzo Ferrari and Todt. The former was a theatrical front man whose intent lay submerged beneath layers of intrigue and mind games; a man who disregarded the feelings of his subordinates and disliked any glory being deflected onto those around him. The other plays the game straight as a dye, with an almost spooky lack of outward emotion yet a real humanity towards those he works with; a man who believes in unlocking the potential of individuals within the team and who is happy for them to receive full credit while he himself shies away from personal glory. Perhaps, for all that, they were and are men of their time: the improvisational entrepreneur and the corporate shepherd. It was the shepherd to whom Luca di Montezemelo turned soon after being handed the controls of a team spiralling out of control and with an engine fire in the early '90s. With the Old Man gone, the Scuderia had become a structureless swamp where in-fighting thrived in a brine of jealousy and paranoia. Such conditions had always prevailed there but the old autocrat had directed them into a flow of productive energy. Now it was stagnant. Though Montezemelo had himself team-managed Ferrari to success in the '70s, second time around he had bigger problems to contend with – he had taken control of the whole entity and the road car side was in trouble too. After tentative steps attempting to re-create the '70s – Niki Lauda was taken on as a consultant and his old assistant Sante Ghendi was made team manager – proved ineffective, he hired Todt as F1 manager in 1993. Todt already had a reputation as the best in the business. If he couldn't fulfil Montezemelo's vision, they said, no-one could. The results were not instantaneous – how could they be? It was a sprawling mess. 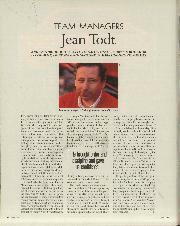 But behind the scenes, the place where he does all his best work, Todt began weaving his magic. 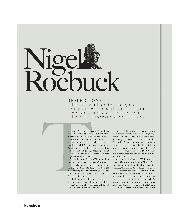 Nigel Stepney, then chief mechanic, says: "He created the right conditions in which to work. When he arrived I had no set job and there was a lot of insecurity inside the team. Todt arrived, picked me up and put me in the job I have today, that of Team Co-ordinator, and I finally had a proper job with my own set of responsibilities. He has brought order and discipline and given us confidence." Order and discipline. Essential qualities for a rally co-driver, the role in which Todt made his name. 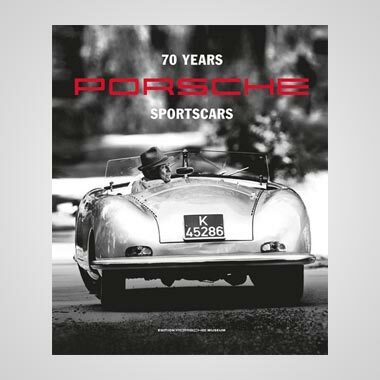 Starting out as an amateur driver in the '60s, he found his talents behind the wheel limited – one parallel, at least, with Enzo Ferrari – and switched to the other side of the car. Here his reputation flourished to such an extent he became something of a hired gun by the early '70s, enjoying international success with drivers like Ove Andersson (in an Alpine-Renault) and Timo Makinen. The latter drove for Peugeot, specialising in the long-distance events, and it created for Jean a link with the French company that was to last until his move to Maranello. Peugeot's purchase of the European arm of Chrysler in the late '70s gave, in the Talbot Sunbeam Lotus, the company a weapon with which to attack the world rally championship. Paired with Guy Frequelin, Todt helped Talbot to the '81 manufacturers' title, though the driver's award went to Ford-mounted rival Ari Vatanen. A few years later Vatanen and Todt were to form a close bond, but by this time Jean had retired from the cockpit to take up his role as Peugeot team manager. It was a wondrous transition and led to a drivers world title in '85 (for Timo Salonen) and manufacturers titles in '85 and '86. Backed to the hilt by Peugeot management, where he had made close allies in his long co-driving years, Todt had created Peugeot Talbot Sport to take the company into rallying's new Group B era. He hand-picked the best he'd worked with in his years with Peugeot and Renault, recruiting several of the latter's employees from its F1 turbo engine programme. The 205 T16 was an instant sensation and the team that ran it quickly came to be regarded as the best in rallying. "It's my job to put the right people in the right jobs," he says. "I am there to intervene if there are problems but on a day-to-day basis everyone gets on with their jobs without interference." Within that modus operandi there are two exceptional skills: his recognition of talent and his ability to 'clear a space' to give them the environment in which to perform without interference. He says, "I am like a sponge," soaking up the external and management pressures so those in the team never feel them. It's an individualistic approach, but then he's never been one to follow the herd. 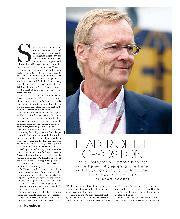 Vatanen: "Even as a co-driver he did things his own way – he always wore cashmere socks, never Nomex. When I lived in London I would regularly go to Harrods for him to get five pairs of them in marine blue. He always insists on the best, whether it's socks or drivers. "Many people don't like him because he is very independent. He has no need to please anybody. He's strong enough not to need that, he's not a populist. With people that he has no personal chemistry with he just deals with business matters in a rather dry manner because that's the most efficient, least time-consuming way. So he comes across to them as cold." If he has a weakness, it's that this 'cold front' can polarise opinions of him within a team. People, particularly drivers, who are not emotionally pre-disposed to such an approach, have come out of the experience of working with him bruised. When moved to intervene in conflict, his will is strong, his control invariably exercised. Jean Alesi once spoke of him as "the worst team manager I've known," while Keke Rosberg similarly failed to hit it off when he drove in Peugeot's sportscar squad. But Vatanen saw a very different side. "His humanity was a vital part of my recovery," he says in reference to the life-threatening injuries he received in the 1985 Argentina rally. "For a time I just could not see light at the end of the tunnel. It was more than a depression about death, it was an obsession. But when I started to see light I knew well that Jean had maintained everything for me. 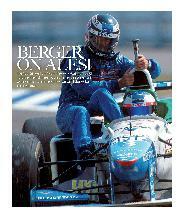 He said 'as long as I work for Peugeot there is a place for you Ari, regardless of your injuries or what you are like'. 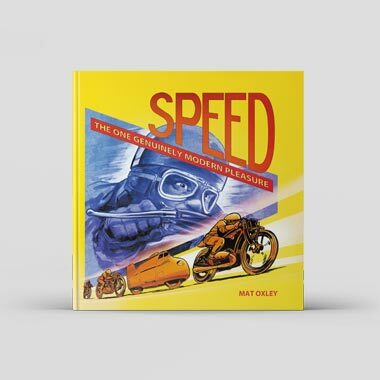 He even had the engineers develop a car that would be driveable without the clutch pedal because they didn't know if my leg was going to work." 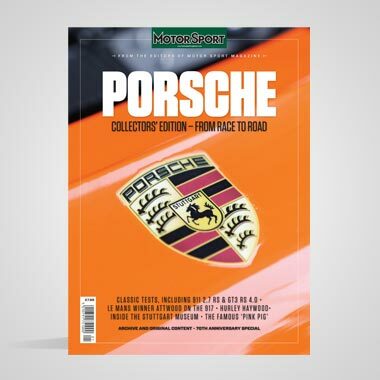 Tim Wright, who now runs the Benetton test team but in '92 helped Todt take Peugeot to the World Sportscar Championship, gives further insight into the man's teambuilding skills: "My wife and I moved to France so I could take up the position but my wife, who's a singer, felt out of place there. Knowing that, Jean got us to dinner with Sacha Distel who has a recording studio in the basement and they did a few bits and pieces together. It gave her something to focus on when I wasn't around. He takes great care to make the team happy and he spends a lot of time with you understanding your personality so he can fit you in the right place then organise things around you to help you." 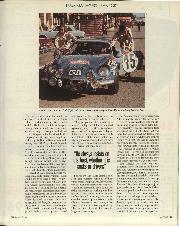 Vatanen recalls that at Peugeot, Todt would endeavour every morning to greet each member of the team with a warm handshake. Mechanics with family trouble would seek an audience with him and he would invariably help. "Also, he would talk contracts with you for the next year in June, not at the last minute with a knife to your throat," says Vatanen. "He'd let you know he believed in you. None of this Ron Dennis 'perform and I might use you again' stuff: Jean's way is how you get the best out of human beings." But he's far from a pushover. "I've been at high-level management meetings with him at Peugeot," says Wright, "and he can swing any deal that is needed. He's extraordinarily persuasive." Although these days he leaves race strategy in the brilliantly capable hands of Ross Brawn, Todt does possess a powerful weapon in the field: he is a human computer. "You can fire any set of numbers at him and he comes back with an instant answer," says Wright. Some of the brilliant, recent, on-the-hoof Ferrari race decisions have surely been aided by this ability. As a team manager he's perfectly balanced, yin and yang. Aggressively expansionist one moment – recruiting the best, then bullying management into giving the team what's necessary – and passive the next – standing back and letting them do their jobs. He gives so much to that role, though, it leaves little room for anything outside it. 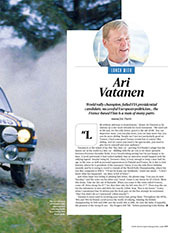 "There are only two things in his life," asserts Vatanen, "his son and his work. I've said in the past that his marriages will never work because he is a workaholic. I think he sleeps in the Ferrari office because I call him at about ten in the evening and unfailingly he's still there. When the workers leave, they see his car and when they get back in the morning, the car is still there." Work rate and talent. It's a formidable armoury for his opponents, and Ferrari being Ferrari, not all of those have resided outside the team. When Todt took over, for example, Lauda was still retained as a consultant. His presence had perhaps been a security blanket of trusted familiarity for Montezemelo, but there were clear conflicts between the Austrian and Todt. Lauda is no longer there. It conformed to the pattern of Todt's insistence of autonomy and the sparks that fly when a equally wilful character refuses to surrender his individualism to Jean's collectivism. See also Rosberg and Alesi. And Barnard. Todt inherited a situation where John Barnard designed the Ferraris from his base in the UK, leaving Maranello as little more than a race base and engine factory. 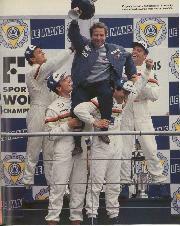 Given Todt's obsession with team spirit, it seemed certain that this arrangement wouldn't survive beyond Barnard's contract. It didn't. But look at Ferrari the team now and compare it to what he took over. It's a fighting unit once more, still with passion, but channelled. The fight is now directed to its rivals rather than turning in on itself. 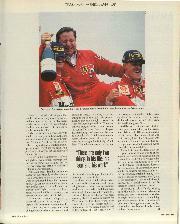 Not all of that is Todt, of course; there are the contributions of Schumacher, Brawn and Byrne to name just three. But he was not only instrumental in bringing those people – guided by his principle of going for the best available – but it's only through the structure he built between '93 and '96 that such talent has not been wasted. These days he talks of finally bringing back the world crown to Maranello and makes occasional reference to what he might do afterwards – take a holiday, get to know some of the countries he's only visited fleetingly when working. But those who know him say he'd be bored within a few minutes.